It was the fall of 2017, and I was in northern Labrador, waist deep in the McKenzie River. My sloping shoulders portrayed the characteristic posture of a frustrated angler tying on another fly. The river felt cold flowing around my thighs while my flies remained untouched. My angling skills appeared to be no match for a nasty cold front which had turned off the appetites of the out-sized brook trout I was (presumably?) surrounded by. In fact, the only thing out-sized appeared to be the expectations that had built up over several years scheming about costs and logistics to get myself to this exact location. The anticipation only increased when we touched down in the float plane and the departing guests were wearing slightly deranged ear-to-ear grins. They mumbled things about huge fish, dry-fly heaven, and calling Paul as soon as the plane landed to book next year’s trip. Paul Ostiguy, a well-traveled fly angler and the owner of McKenzie River Lodge, had managed to pull off something lots of us talk about when sitting by the fire and forget about by morning. Paul is one of those fun-loving folks who struggles through school and then powers through real life. Success came quickly as he moved up quickly within a tool company by vastly improving the marketing and sales. One of the first things he did with his newfound income was to purchase a remote fishing lodge based only on a word-of-mouth recommendation. My wife had accompanied me on the 1,007 mile drive north from Massachusetts and gamely fished on through the first two days of fishing in cold and rain without complaint. I felt the pressure of her expectations being added to mine. Despite what she’ll tell you, she is an accomplished angler, but she only breaks out her waders at prime destinations. Though unspoken between us, our morale was low. I was feeling like we needed some divine intervention. The word immaculate means having no stain or blemish: pure. You may have heard it used to describe the conception of someone who could mold fishers of men and coincidentally shares my initials. Football fans are familiar with the “immaculate reception,” which refers to a 4th and 20 game-winning touchdown resulting from an ill-advised Terry Bradshaw pass deflected backwards into the waiting hands of Franco Harris. That miraculous play sent the Steelers to the 1974 Super Bowl. But, the nearest football was over 120 miles away (think about that for a second). Back in the angling realm, biologists use immaculate to indicate “having no spots or marks.” It is the precise term to describe the pure white leading edge of Salvelinus fontinalis, my favorite fish. “Spotless and pure” also describes the pristine environs of this remote swath of northern Labrador. 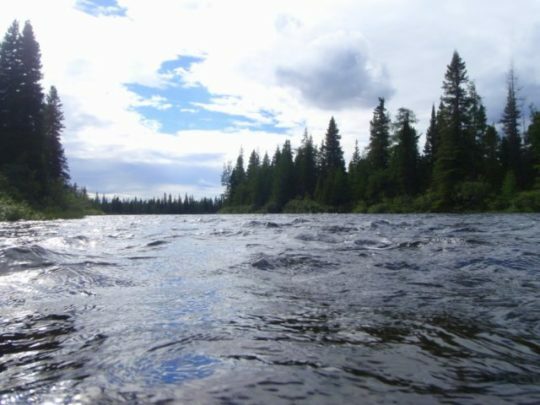 Large trout inhabit all of the waters fished from the home base of McKenzie River Lodge. Amazingly, the size of the fish is often eclipsed by their beauty. Trout and char are like most other fish in that they display indeterminate growth; that is, they continue growing throughout their lifetime until they die. 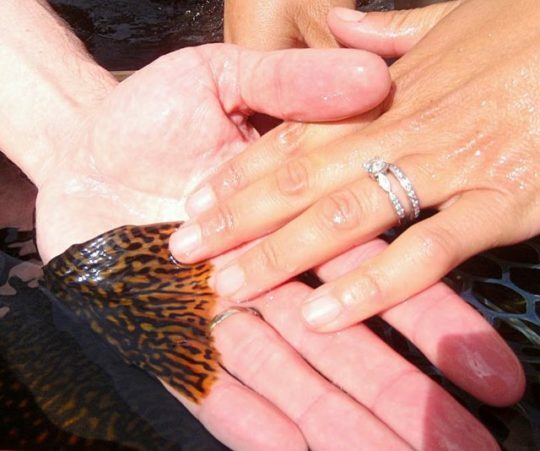 Two simple things combine to produce trophy fisheries: the growth rate and the life span. 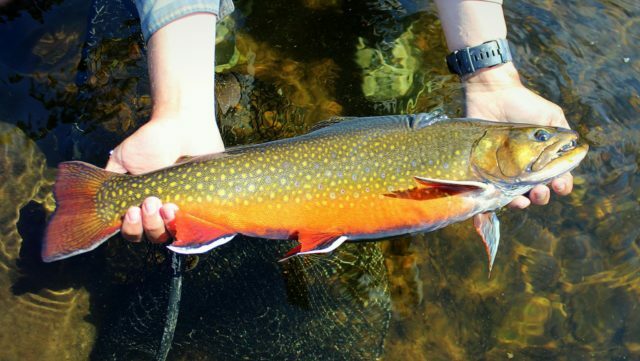 Brook trout in Labrador can see 10 or more growing seasons, while their brethren that swim in small streams in the U.S. are typically lucky to see three. 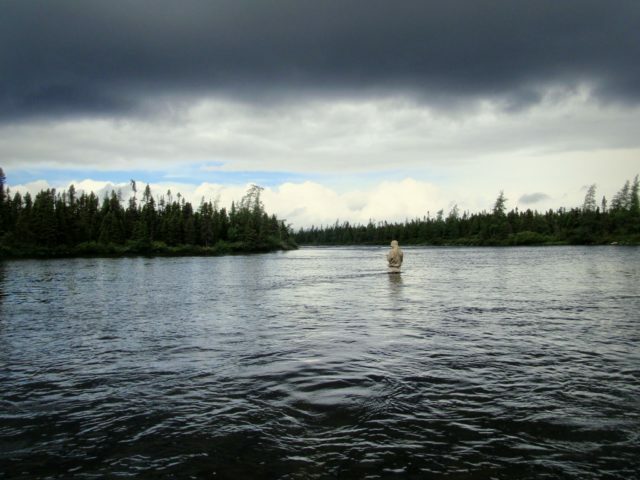 In reality, there is a complex interplay of many factors that ultimately determine the health of a fishery, and each of the following factors can have an influence on the others: These include an abundance of forage, an intact food chain, ample and varied prime habitat, the presence of predators like pike and lake trout that prevent overpopulation, good genetics, absence of angler harvest, and a lack of impact from non-native species. In nearly all other places that you can drive to and fish, human activity has a negative influence on these factors. 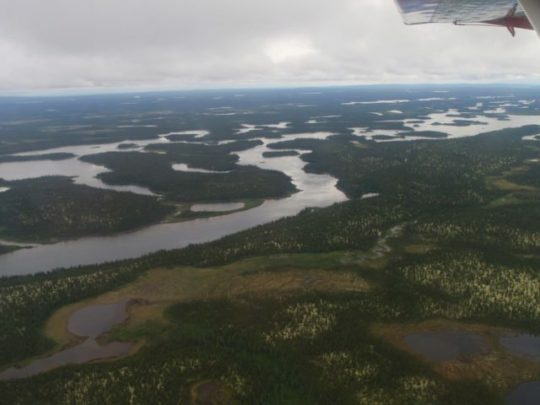 The Labrador landscape is a maze of interconnected wetlands, rivers and lakes. The result is a steady flow of cool water and stable flows after rain. The land becomes a giant sponge that absorbs precipitation and produces water clear enough to spot large white lined fins waving in the current. McKenzie brook trout, as large and old as they may get, don’t read ecology textbooks. They just feast on everything they can fit in their mouths, inhaling baitfish, insects, and mice from ice-out to ice-in and pack on weight at a remarkable rate. The result is heavy, tall-bodied brookies with powerful rudders and jaw-dropping color. The weather gradually improved. The cold rain eventually ceased. The clouds, ever dynamic and captivating due to the low angle of the sun, began to give way to clear skies. The fish once again fed, and I was able to move on from follows and short strikes into solid hookups. We saw the sun, and it had an intoxicating effect on the guides, the guests, and the fish. The river rounded into form, becoming generous. We caught fish on mice, streamers, nymphs, and dries. The fishing peaked on the last day. I can’t really conjure up a better start to any day than wading a beautiful river with my wife while picking up several beautiful fish on dry flies. Each fish was taken after a proper sipping rise that made the large dry fly disappear like a tiny size 20 midge. The fish were no pushovers. Takes required accurate casts of 20-30 feet with a drift right in the feeding lane. We played with fish steadily throughout the day. I fished my way back to the first pool again in the early evening. Andrew Murphy, our guide for the day, is one of those instantly-relatable people you suspect to have known well in a past life; a young man with an old soul. I happily assented when Andrew instructed me to tie on a size 10 Ausable Wulff. My wife relaxed on the bank and took pictures. She had already caught more than her fair share of large brookies, lake trout, ounaniche (landlocked salmon), pike and whitefish. She was content to watch this round. A week spent getting in tune with the river allowed me to lightly place a long cast (instead of losing my nerve as expected). A dark olive head the width of my hand broke the surface, casually consuming my fly. The back followed, just as wide, the hint of a solid red tail disrupting the surface tension fully two feet behind. I slowly set the hook and felt a solid resistance. The clarity and calmness of that moment was surprising. It remains so even now. I didn’t measure that fish, not even with my hand. Nor did I weigh it. It was a male in stunning spawning colors. It might have covered the blade of a canoe paddle if it had been laid on one, but by then, that wasn’t the point. I was about to release a fish displaying a cosmic collection of red planets and yellow stars all set against a dark background. Below that, the red and black fins featured pure white exclamation points. It made me happy. I didn’t deserve it, but the best part of the day was still to come. This was the first night without 100% cloud cover, and I headed out to the dock after dinner on the off chance that I might catch my first glimpse of the Northern lights. Andrew and another guide brought down blankets. We collected mosquito bites and talked about the meaning of life while we laughed about Monty Python. “Aurora!” Andrew said suddenly, bolting upright. We watched as an eerie green glow morphed from a small smudge to a full-blown wave that consumed the stars and blew my mind. A silent show played out on a grand scale. 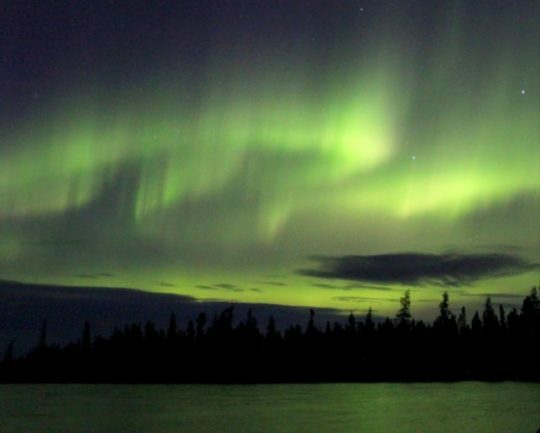 I went up the cabin and woke my wife so that she could enjoy the dazzling display. As I have accumulated days on the water and trips to various places near and far, I have noticed that the flow of the events is as important as the events themselves. If Pittsburgh had scored a touchdown on their opening drive and kicked two field goals to hold on for a 13-7 win, then that game 45 years ago would have long ago been forgotten and never earn a nickname. The longer the buildup and the greater the adversity overcome, the better the memory lives on. Fishing trips, like life, rarely follow the plan we may lay out for them beforehand. Somehow, things turn out better that way. As Paul Ostiguy points out, Labrador makes people realize that most things that we worry about in our daily lives are not that important. I know I’m not alone in feeling that the McKenzie River Lodge is a difficult place to leave behind. My wife ended up enjoying the trip as much as I did and in a different way. It also makes clear what is truly important: meeting new friends, spending time with loved ones, seeking adventure, and making the most out of what life gives you. Looking back, the trip was immaculate. An amazing set of photos and prose, JC. Really, more of a meditation. Thank you for sharing your gifts with the fly-fishing world. Great read! Really enjoyed the journey. Hope I get half as much out of fishing that you seem too! What a great story with amazing pictures. I am glad your wife got join you on this spectacular adventure. I can’t believe the size of that brook trout. It is hard to believe it is the same species of the ones that fortunately inhabit our small streams around these parts. Glad you enjoyed it Sam. Once the weather turned the brook trout were pretty hard to believe up there! I’m thankful we have some pretty great brook trout here in MA still. Wonderful story! Well written, just like I was there! Jamie great article. Love how you were able to enjoy the trip with the wife. Thank you Ashu- glad you enjoyed it.